Mooreville native Jessica Peralta is the first Mississippian to receive a highly competitive Knowles Science Teaching Foundation fellowship worth $175,000 over five years. OXFORD, Miss. 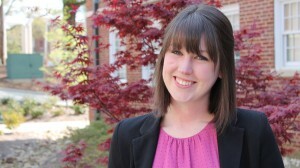 – University of Mississippi graduate student Jessica Fancher Peralta doesn’t begin her first year of teaching until this fall, but she has already landed a sizable bonus. The Mooreville native is the first Mississippian to receive a Knowles Science Teaching Foundation Fellowship worth $175,000. A five-year fellowship for early-career STEM teachers across the country, the program will offer financial support to assist Peralta with a variety of grants for classroom materials, professional development, networking opportunities, travel to national conferences and more. Founded in 2002, KSTF teaching fellowships are designed to attract and retain high school STEM teachers who demonstrate a high level of content knowledge, effective teaching methods and show potential to become an influential teacher leader who will make a career of teaching. According to KSTF data, more than half of all U.S. STEM teachers have less than five years’ experience in teaching. The fellowship program, which has a 95 percent retention rate with its fellows, includes more than 250 fellows in 42 states across the nation. Three times a year, KTSF fellows gather at conferences for professional development – with their cohort in the fall and spring and with all current fellows in the summer. Over five years, fellows advance through three phases of development focusing on different amounts of content knowledge, teaching practice and leadership qualities. Upon finishing the program, fellows are dubbed Senior Fellows and are provided support to continue involvement in the program by leading professional development sessions. They also can apply for select grants and can receive up to $2,000 in support to pursue national board certification from the National Board for Professional Teaching Standards. Peralta received a bachelor’s degree in mathematics education from the UM School of Education in 2013 and is a graduate research fellow at the UM Center for Mathematics and Science Education. She plans to finish a master’s degree in curriculum and instruction part-time over the next few years.